This fluffy slime recipe is easy to make at home with shaving cream and glue! Recipe by Maia. Maia found a fluffy slime recipe on YouTube recently and our studio has been turned into a laboratory for making and experimenting with slimes. She and Daphne have made about a dozen batches between them in a rainbow of colors. But lately, it’s been about the homemade slimes and putties. This post will show you how to make slime with shaving cream. The resulting fluffy slime is stretchy, putty-like stuff that is fun to knead and play with it. The kids even make balloons and balls with it! Our studio looks like a science laboratory and they’ve been taking an experimental approach to this. Each batch is a little different with slightly different properties of stretchiness, fluffiness, and non-stickiness depending on the amounts of extra glue, shaving cream, eye contact solution, etc that they added. And, of course, they’ve been working to get the perfect colors and tints by adding and mixing food coloring (and liquid watercolors in a couple of cases). Now they have a rainbow of fluffy slime. Here’s the recipe and step-by-step instructions. Makes about 1 cup of slime. Adapted from the recipe in this YouTube video by Sarah Choxo. *Or, if you’re going to be making lots of slime, you might want to consider buying your glue by the gallon. Also, if you don’t want to track down all the ingredients for slime, you can buy slime kits now! Here’s a rainbow slime starter kit by Elmer’s that is well rated on Amazon. It would be interesting to see if you could adapt it for making fluffy slime. Perhaps just by adding a bottle of shaving cream? 1.) Squeeze one bottle of white glue into a medium bowl. 2.) Stir in 1/2 cup to 1 cup of shaving foam, depending on how fluffy you want your slime to be. 3.) Add food coloring to color desired and stir. 4.) Mix in a few squirts of eye contact solution (this makes it less sticky). 5.) Add borax solution a teaspoon at a time until the mixture forms a clump in the bowl. This is what it looks like when it first pulls together (above). 6.) Knead the fluffy slime. If it’s too sticky, add more solution. If it seems to need more glue or shaving cream or color, you can knead that in, too. And, if you want your fluffy slime to be scented, knead in a few drops of essential oil. 7.) Store in a covered container or plastic bag to keep from drying out. Fluffy slime is a great sensory material to hold, squeeze, stretch, and fiddle with. Maia, my sensory girl, always (and I mean always) has some sort of slime, putty, dough, water beads, or kinetic sand in her hand. Even (or especially) when she’s doing other things such as homework, riding in the car, watching a movie, etc. Crazy Aaron’s Thinking Putty has been her number one requested gift at birthday’s and Christmas and whenever we walk into the toy store, but at 10-14 dollars a container, it’s nice to have a homemade sensory putty to play with and make. This homemade fluffy slime is pretty good stuff, too. You can even blow big bubble balls with it. To pop or to toss (gently). How about you? Have you made your own putty, slime, or gak? Maybe now is the time! Learn how to make butter slime with this butter slime recipe and video. It’s the best! This butter slime recipe uses Model Magic and is super soft and stretchy. 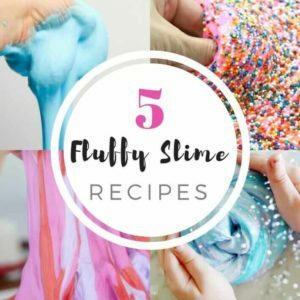 My new post with fun variations of fluffy shaving cream slime using different themes, colors, sprinkles, sparkles, scents, and extra fluffiness. Want even more? Check out Karina Garcia’s DIY Slime book for “15 Cool, Easy Borax-Free Recipes” with step-by-step photos and instructions. Apparently they are advising against using borax in kids crafts. I just thought I would let you know; maybe it is fine once in a while but some families do a lot of crafting and might not be aware. its not fine once in awhile there are safer products one can use without using borax…and getting 3rd degree burns…..on childrens hands. 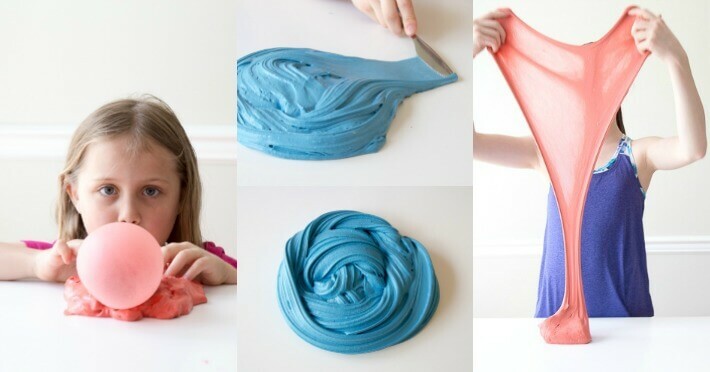 try safer way to make SLIME..1/4 cup,,,shaving cream and 1–2 TLBS. clear TIDE detergent (sensitive skin).1 bottle Elmers craft school glue…about 725ml.a and about …mix each time you add an ingredient…lastly add a few drops food coloring (color of choice )…mix then place onto table top and knead together by pulling all four side up and in towards middle..(this is kneading method)..
Borax does not give third degree burns. I have very sensitive skin & open cuts to my hands from my skin being very dry. However I tested borax using my bare hands to check it would be safe for my child to use. I was suprised but I had no reaction to it at all it seems perfectly safe & does not burn the skin. Thank I had loads of fun with the slime!! The reason that child had burns, is because the child did not wash her hands. If you want to find out actual facts about Borax, check out Steve Spangler’s explanation of borax on YouTube. It is a naturally occurring compound originally found in lake beds in Tibet. I hate when people listen to everything they hear on the internet without doing their own research. Slime is a great sensory activity for kids. Let’s not ruin it without doing our homework. I have used slime with kindergarten and preschool students for over 10 years and NEVER once had any adverse reaction with any child. The recipe calls for borax which is a mineral mind out of California and is a cleansing agent that is 100% natural and safe.non toxic. Boric acid will give you 3rd° burns and is toxic. I’ve heard this too. I deal with chemicals at work, and looking at the MSDS for borax and the warnings on the box, I am not concerned. There is one story about some mother whose daughter got 2nd degree burns on her hands, but they do not mention what they used or how they used it. As far as I’ve researched, borax will not do that. Boric acid will…so maybe they confused them and used the wrong thing. But vague stories like this seem to confuse a lot of people in this age of the internet, where everyone thinks they’re an expert. With that said, if you can get the same effect (I think it’s the binder) without it, then it’s moot. When you mix the borax with water, you are creating borate ions which chemically react with the polymers in the glue to create the slime. If you use the recipe of 1 tsp. of Borax to one cup of water, you create a very mild solution that shouldn’t irritate anyone. If you use contact lens solution instead; again you are using it for the borate ions. It does contain boric acid, but a very mild solution. It is mild enough to put in your eyes, for goodness sake! Neither solution should burn or irritate anyone! However, keep slime from children who put everything in their mouths. You are creating plastic, not something that should be eaten. This is our very first time making slime at home. It came out perfect. A great craft to mark with your child. Thanks. Great recipe. easy to follow! Highly recomended! I don’t know if this works but thanks for the recipe. I hope it works! Please, Heavyn Taylor. Maybe you just have a bad touch with slime or a really bad sense of humor, but don’t try to ruin the fun for people. It definitely works, so maybe you just need to START OVER. Ever heard of such a thing? How large is your bottle of Elmer’s glue? I have different sized bottles so I don’t know which quantity to use. Trying to see how large it is in your pictures…..
We just use the regular size bottle of glue. I’ll go look for quantity… Okay, it’s the one that is 4 ounces or 118 milliliters. Hope that helps! Can we use any other white glue? Other than Elmer’s? this slime recipe really works and you should try it with your kids or grandkids its fun and easy and does not make a mess how ever my only note would be that the firs few days the food coloring might show up on your hands still however it will stop eventually and also if you add glitter and food color it can get expensive if you don’t have this stuff at home like I would but cheap food color just to save money. We made this tonight, she had a lot of fun :) it seems a little wet and made sucky noises as she kneaded it. Should we add something else to it? It is drippy but isn’t really sticky. We are slime newbies. Maybe try another teaspoonful or two of the borax solution? It seems like adding more liquid to a wet situation, but for us, the borax *really* bound up the glue/foam batter and made it more like a bouncy, stretchy, resilient putty. Also, the more they stir then knead and play, the more stretchy and resilient it gets. It reminds me of pulling taffy. We tried this today. My kids are *thrilled* with the results. We did make sure that that borax was dissolved and clear, not at all cloudy, in the warm water–it took a few minutes. They each used a 4 oz bottle of Elmer’s school glue, 1/2 c. Barbasol shave cream, a few drops of food coloring, and then only 2-3 tsp. of the borax/water solution. We had a lot left over. We didn’t need the contact fluid at all. One child added medium-grade glitter to good effect. It’s not too sticky. With our proportions it’s a bouncy, light, stretchy putty texture. They like the rubbery noises it makes when they poke it–it’s like that rude noise putty! Maia says to maybe add more shaving foam. But she also said that if you added too much shaving foam to begin with, it might have deflated. Our slime was rlly hard idk what is wrong with it? How do we fix it? Maia says to try it again with less borax. Also, the more you stretch and knead the slime, the more flexible it becomes. I couldn’t find Borax so I used Boric Acid. It worked, and I wasn’t burnt. What should I look for when I buy contact lens solution? I went to the store and was totally overwhelmed by the options. What ingredient should it contain? Is it the cleaning kind or the storing kind or the rinsing kind? no alls you need is glue shaving cream and contacts solution. It should Contain Boric acid. Hope that helps!! Whatever you use as activator must contain boron in some form whether you use contact lens solution, which contains very mild boric acid, Borax = sodium tetraborate or laundry detergent, because the borate ions react with the polymers in the glue. You only need a tiny bit of borate ions so add the activator very slowly. Too much activator will make a harder plastic and it won’t be slimy slime. If it did not go into a clump right away, I imagine one of the ingredients was “off” somehow. It’s still wet and I put all the borax solution, and it’s messy… how do I fix it? I think I put too much shaving cream. Should I start over later? Or, if there’s a way to fix it, can you please help? Super simple and this one actually WORKED! It turned out okay without a huuuge mess! My daughter’s officially impressed! ?? I tried this and it did NOT work! I was actually surprised that it didn’t work. But I suggest that you don’t give out recipes that don’t work! I’m sorry it didn’t work for you, Audrey. It’s worked the many, many times my kids have made it and it seems to work for others as well. Perhaps try again and watch ingredients and amounts carefully. Or try a different recipe. One of the ingredients for contact solution is Boric acid. Great recipe! Going to try it right now. this recipe is amazing! thank you so much! Tried it at home with my 5 year old. Worked perfectly. Easiest recipe to follow. Thanks! It worked out good very great instructions and I like because it was messy. I really enjoyed it. THANK YOU! Our slime came out fine. We had tried other recipes, but failed. This recipe actually worked. My granddaughter loves it and is very proud of herself. I looked up the ingredients of eye contact solution and that is where the boric acid is. I wonder what about the solution that improves the slime? my slime came out rubbery! did i put in too much borax or too little shaving cream???????? 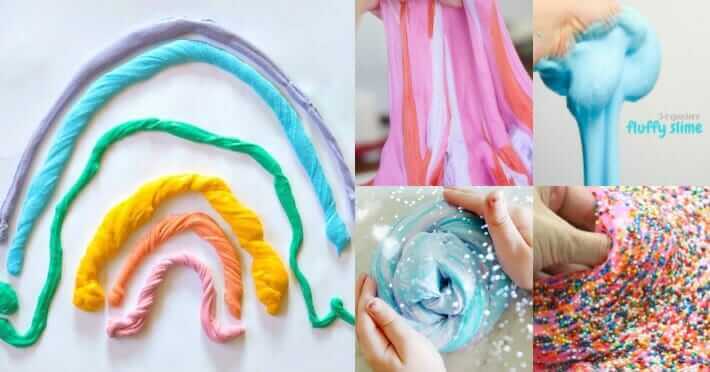 Going to try it this weekend, she loves slime. I used this so cool thx for the page I luv it as a nine yr old it’s super fun to make !!! !